im not sure if this is possible but ill ask anyway. would there be any chance i could buy a personal preview where you can loop less than half a measure on the falling note interface? i really want to loop smaller parts of a piece, i used to loop 8th notes but this isnt possible anymore. i would have no problem paying for this if it is possible. The next preview will actually allow shorter loops. Someone else brought that to our attention a few weeks ago and I couldn't find any good reason why the limit was set as large as it was. I think it's back down to between 16th and 8th note length. EDIT: Oh! That was you and it was a few months ago! Time has been flying lately, sheesh. In any event, you won't have to wait much longer. - if the repeat (end : || bar divider) occurs inside the loop it means the user does not want to practice the repeat. The good news is that the timeline bar at the top of the screen "unrolls" everything and presents the entire song linearly. So, there is no such thing as a musical repeat in the timeline. Worst-case, if you can't get the loop to behave the way you want using the sheet music area, you'll always be able to adjust things in the timeline to get exactly what you want. Maybe you should just require that sheet music be displayed in timeline when looping. You could have the loop controls automatically go into timeline display so you don't have to answer the "why is looping not working in sheet music mode" questions. If I may ask, could we please improve how to split left/right since many MIDIs i find just don't have the left/right split properly. I find it difficult to split hands in the current UI. Any changes coming to this? How would you improve it? Which parts are frustrating? I would be glad if we can make the splitting on the main screen so if i play something and want to change hands i would able to do it and not to search the place in the splitting area. Another thing is that the sheet music is in the main screen so if i want to reorder the notes i will use it. And the sheet music isn't in the splitting area. I concur, having to search to split left/right cound be improved, I am seeing issues where I can't save my notes split, the keyboard appears cut off for some reason, looking forward to trying Synthesia 11, beta builds. What did you mean "can't save my notes split"? If you back out of that screen and immediately start the song, the hands aren't split the way you had just indicated? Or they're not saving correctly after closing and reopening the app? The keyboard being cut off is intentional: we push it down most of the way to free up more space on the screen to assign falling notes. On that particular screen, the keyboard isn't used for much besides a rough position guide, so it made sense to hide most of it. Sometimes its only partly split, it would be nice if we could just split the entire piece, directly. Or perhaps specify the note range to split from? I know MIDI files are never perfect on splitting and you get some sections where its not possible to play the notes given hand length limits. The "Split from Here" feature on that screen lets you do the whole song at once. See step #3 in this guide. Please if you can't transfer the split area to the main board- maybe can you make the sound we be in the split area too? That demo is just about the worst-case scenario (using an instrument that sustains forever), and it's still not so bad. All you need to do is rewind the song the slightest bit and it will cut off all sound. That feature will show up in the next dev preview. A big THANK YOU from me. I really love the changes on the dev build, it's finally got me to learn how to read sheet music a bit, which was long overdue! In the process, though, I found what appears to be an unreported bug (or, I haven't seen it in this thread, I may have missed it). This screenshot is from one of the pieces that came with Synthesia - The Silly Seal, under Easiest. I guess in this case it could be changed to display as an F# instead of a G flat, but I wouldn't know if this is down to the file itself or how Synthesia is reading the file. I don't know if there would be a way for Synthesia to resolve this and display it as an F# and G chord automatically so it's more readable. Although, this may look weird if, say, there's a chord of F, F#/E flat and G together (if anyone would ever want to). 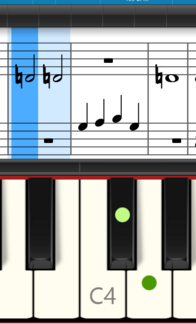 I saw elsewhere that you're adding more features to how notes are displayed on the sheet music to bring it more inline with the falling notes, are you planning to include colouring the notes by hand? Yeah, multiple note-heads with correctly stacked accidentals is on the list for Synthesia 11. It's a rather involved topic (scroll down a page or two), so I can't promise it will end up perfect. But, it should end up in a place better than "completely broken" like it is today. Wow, that looks super complicated! Fortunately, it isn't too common (at least in the stuff I'm playing! ), and even if it isn't clear initially, you can tell what it means after seeing it once.